psssst? want to hear a secret? My friend Janet just broke the news and I had to share. 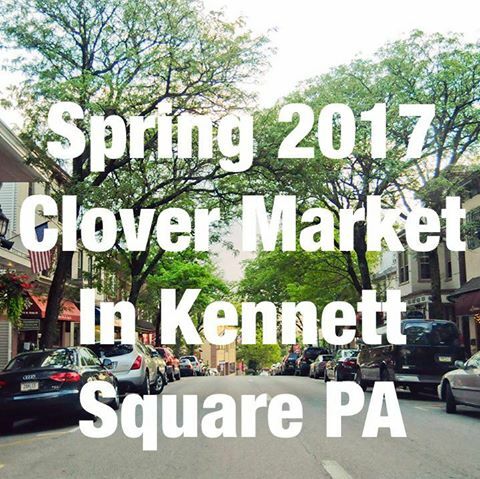 Clover Market is coming to Kennett Square in the Spring of 2017! I think I may actually know something coming to Kennett before my dear friend and fellow blogtress Tilda Tally-Ho. So you might not have ever heard of Clover Market, but trust me those who seek vintage, antiques, local art and high end curated crafts and handmade jewelry….Clover is a gem. I have been a Clover Market fan since it started in the spring of 2010. As a matter of fact I was one of the many people who went to meeting after meeting in Lower Merion Township until Janet got approved. So Clover has been a hit ever since. 2017 will be Bryn Mawr, Kennett, Collingswood NJ, and Chestnut Hill. Chester County save the date! Hi everyone…..have been thinking about trying to find some real affordable artwork to hang in our house. Does anyone have any suggestions on any show rooms or places to go in the area to purchase? A lot of the answers came back suggesting local artists. But then there were a bunch which came back were along the lines of go to a craft store buy canvases and paint and let your kids play Picasso. Ok look, nice idea for a playroom or a kid’s bedroom but that is a made for HGTV idea that makes me crazy. People trying to find affordable art aren’t necessarily wanting to do the art themselves or have a house full of finger paintings on canvas. I am not anti-child art , I just think inexpensive doesn’t need to always mean loving hands at home. We live in an area that is rich in artistic talent. 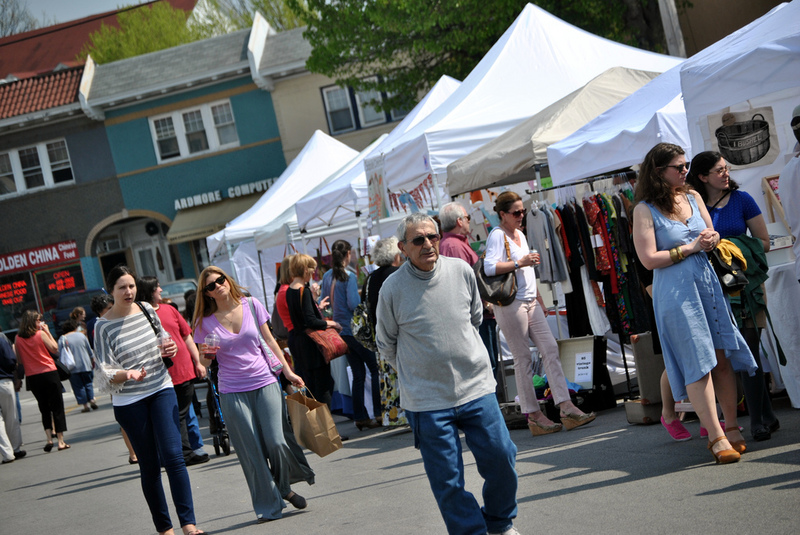 All you have to do is go to fairs, festivals, local art shows. Sometimes at the shows the artist prices are higher so take their business card and contact them after the show. Events like Clover Market have tons of local and beautiful vintage art. For years I was the publicist and photographer for a small arts-based nonprofit called First Friday Main Line (The photo at the bottom of this post is actually one that was taken during the First Friday Main Line of my framed photography on exhibit in a shop in Ardmore called past *present* future and some of my work is still for sale there). Anyway, one of the things about Friday Friday was “art in unexpected places.” Because there were not art galleries in Ardmore, the local artists would exhibit out of stores and restaurants. And it gave people the opportunity every month to buy reasonably priced art at one of these events. So art is truly all around us. 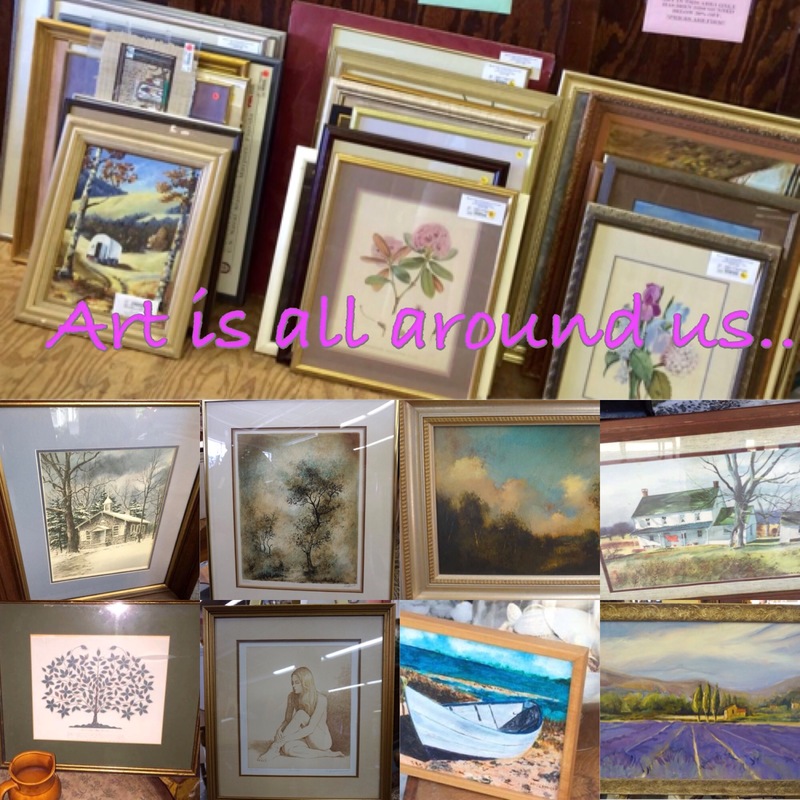 And you can also find terrific art at barn sales, at garage sales, in consignment shops , grift shops, and even the local yard sale groups on Facebook. The thing about art is it should speak to you. It doesn’t necessarily have to be expensive or well-known or even highly collectible. It is simply that you have to like it because it’s going to be hanging on your walls. Not all of us are born with the bank account and can afford an art consultant or trips to upscale galleries. So seriously? Look for your art in unexpected places. I love the Yellow Springs Art Show. This year it starts April 25th. this is a show that gives you a really good look at a lot of amazing local artists, and a lot of what I would term the modern Chester County School. It is not a show I buy from a great deal to be honest because the prices can be very high. But if you really like a piece of the show it never hurts to ask the artist if that is their best price. I also really love my friend Sherry’s store in Ardmore called Past*Present*Future. Sherry is an artist by training so her store is a fabulous mix of all types of art including wearable art and beautiful handmade jewelry. 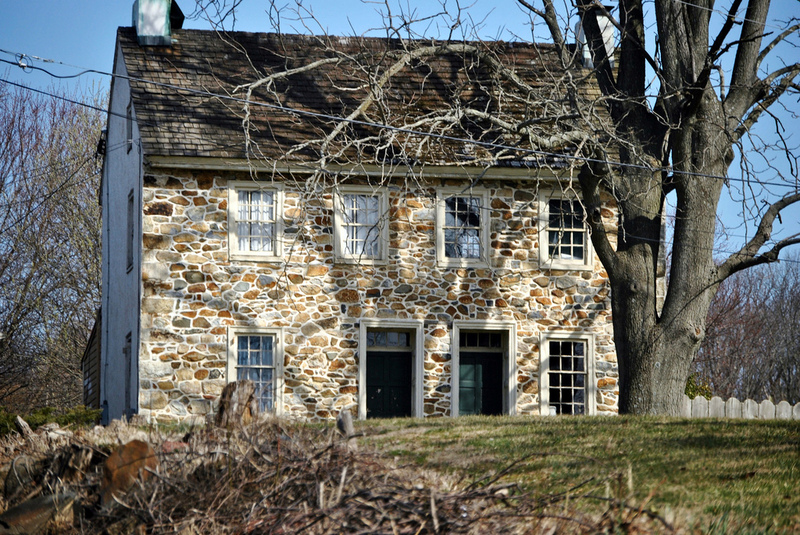 Now some of my other go to places for seeking out art include Smithfield Barn, estate sales, holiday church sales, fall festivals and some local Chester County favorites. Resellers Consignment in Frazer and Frazer Antiques and Consign-It Furniture in Kennett Square. 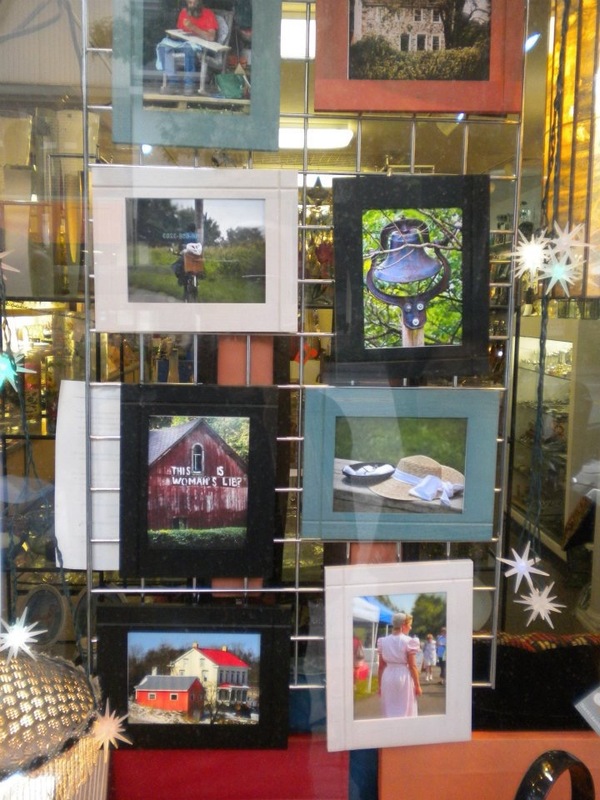 Chester county is also loaded with artisans who repurpose old and vintage items into new pieces of art. So you have a lot of choices out there. And eBay and Etsy are other places to discover inexpensive art. Another way to acquire art is when you travel. Going through New England? Or through New York State? Or down south? Out west? There are artist colonies everywhere you go and often you can pick up something lovely that you might have to frame when you get home for pennies on the dollar. Don’t be intimidated by buying art. Go out and see what you like and experiment. It doesn’t have to cost a lot to get things you like on your walls. Truly, you can hire that interior designer if you want to but you don’t have to. You don’t have to be design challenged and you can find the time. I get inspiration from all over. People like Lara Spencer and Cari Cucksy inspire me. Not Martha Stewart any longer. Besides her issue with bloggers she is way too comfy with pastel paints and washes and she is enough to make you dream in crème de menthe which is too close to Kmart green and similarly pastel nightmares, but I digress. Lara Spencer used to be a host on Antiques Roadshow. 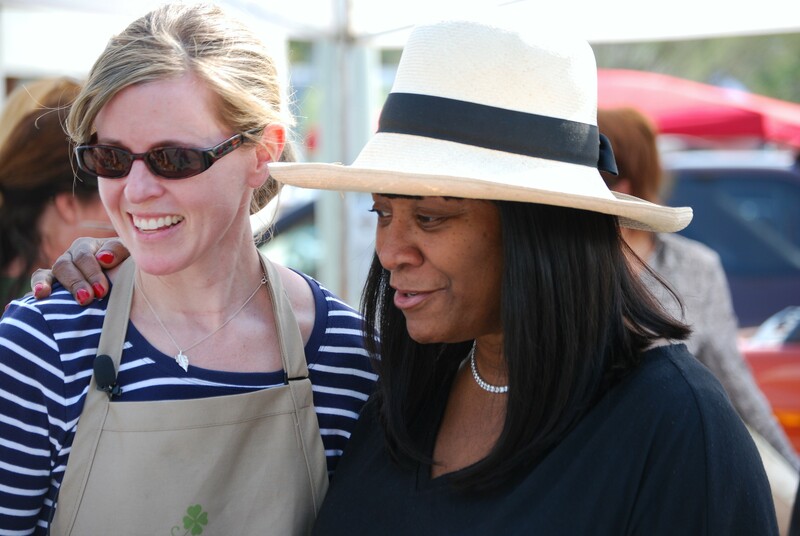 A lot of people know her from being an anchor of ABC’s Good Morning America, and from Flea Market Flip. Now she has a book I Brake For Yard Sales and a series by the same name that made what appears to be a limited debut on HGTV. I say limited because HGTV is a little hard to figure these days. They replay a lot of home crashing series but no real gardening shows any longer and don’t have a lot of air time (in my opinion) on some of these fun shows like I Brake For Yard Sales or Cash & Cari. Why I love watching ladies like Lara Spencer and Cari Cuksey is because they show you it is not a beige, beige world and not everything has to be all matchy-matchy. They give you great re-purposing ideas too. I have never needed to hire an interior designer or decorator. And I know a few who are amazing. But in this economy, why not train your own eye and save some money? At least do some of the leg work if not the whole thing? I did our new house by myself with my sweet man (and a terrific carpenter who built us amazing bookcases and storage benches). Fortunately our tastes are compatible. Or should I say he is a man who will actually communicate about house stuff? 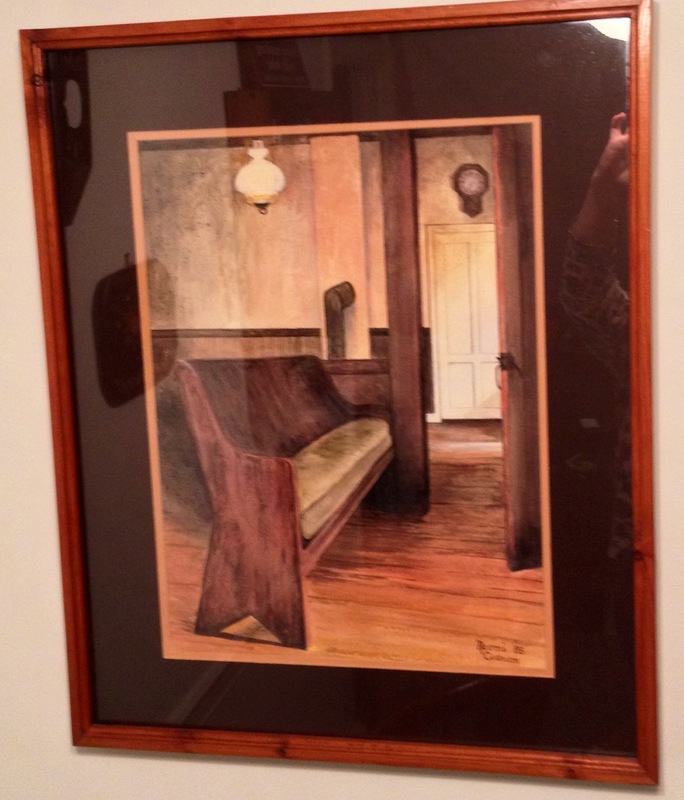 unknown watercolor – approximately $20 from Smithfield Barn in Downingtown. I guess I am kind of sort of quasi-traditional with a dash of quirky . I like vintage and I like the lines of a lot of older furniture. I like a more country or should I say less formal kind of look as in what some would call “farmhouse chic”, but if you are expecting mad for plaid with ruffles, gag me with gingham, so not my style. Yet I am not so casual as in Cindy Crawford icky denim love seats or lots of plastic things. Comfortable and pretty works but not a frilly gilded lily. And also a component of my home to be considered are things from my childhood home I liked and wanted to emulate. And interestingly enough, my sweet man and I both had mothers who loved to check out estate sales, so you could say we sort of inherited this treasure-seeking meets bargain hunting fun. I do think my style is uniquely my own and can’t be pigeonholed as one particular category because to me what I have done is a little bit of this a little bit of that. I have put what I love into my home and it is a house where every room is used. No, the living room is not for teenagers to play video games in, but neither is it some shrine to formal living and roped off with a velvet rope except for special occasions and sherry by the fire. I like pops of color and am not afraid of color. I don’t like wallpaper. I can admire it in other people’s houses in small doses, but would rather look at a colorfully painted wall than wallpaper. I remember once being in a house in Massachusetts near where the Brimfield Antiques show is held. You would have thought they house would have been New England fabulous, right? It was instead a study of contradicting and competing wallpaper. Every room was papered and even the halls. And nothing complimented or flowed. The house literally gave me a pattern headache. And the owner was so house proud too. But they loved their house, so that was what mattered. I have a glass bowl my sister gave me one year for Christmas about ten years ago. It was inadvertently color inspiration for a lot of my current living room. The bowl is a beautiful almost cranberry crossed with raspberry kind of color. With it in mind I found a traditional Chippendale hump back sofa of similarly colored damask circa late 1950s or early 1960s at Reseller’s in Frazer for $125. Yes, really. It was a lucky find that had sat on the sales floor until it was reduced, reduced, reduced. It was in pristine condition and the only thing it needed was the legs dusted. 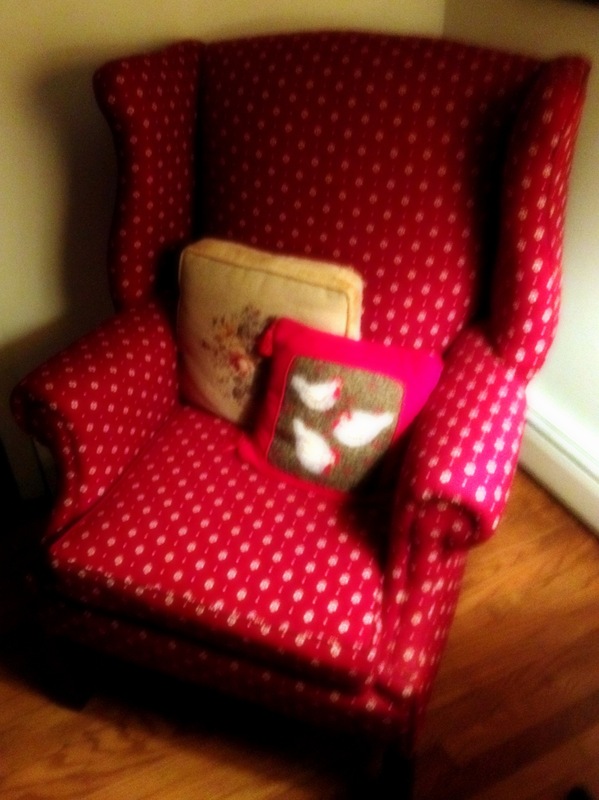 At the Eclectic Market on King Street in Malvern one Saturday last fall I found a vintage wing chair in a pattern that was palatable, and compatible to my sofa. Yet it isn’t nauseating matching like furniture garanimals. And this sturdy chair was…wait for it…forty dollars. Yes $40.00. It is that easy. A little time and effort and it actually comes together. Not all on one day, but it does come together. You all know by now that I love barn picking. And yes, the Smithfield Barn in Downingtown is that awesome. Kristin has a fabulous eye and thanks to her I can actually identify some country antiques now that might impress an actual farmer or if not that an antiques dealer or two. I also will check out yard sales and estate sales and church sales and country auctions and resale shops and flea markets. I love Frazer Antiques and the dealers who work there are so incredibly nice and patient with my 10,000 questions. They are helpful too. 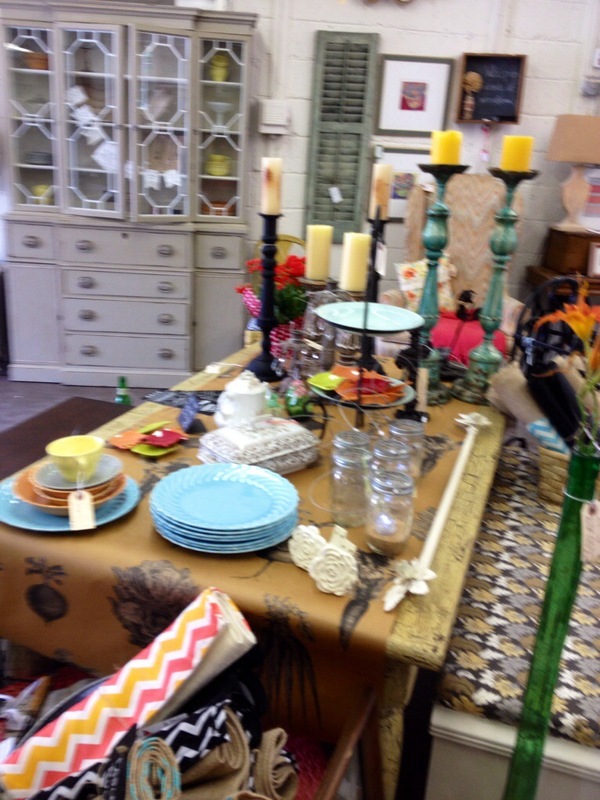 Resellers Consignment in Frazer is also a favorite haunt and they get fabulous stuff all the time – even vintage table linens, crystal, lighting fixtures, garden ornaments, artwork and china. Not just furniture. But the trick to them is if you like it, buy it because much like the Smithfield Barn, stock move quickly because the pricing is reasonable. And I can’t forget Garage Sale Chic Chester County. Now there is a woman with a terrific eye! And without her I would not have my pot rack for $60 in my kitchen and the only floor lamp I have ever liked in my life. I bought the furniture pieces mentioned because among other things they are sturdy, classic pieces I can reupholster some day and still love them. And that is part of developing your eye: imagine what something might look like stained differently, or painted, or reupholstered. I love going to places like Clover Market (Ardmore, Chestnut Hill, and Philadelphia in the winter at the Armory) because I might spy something fun and quirky. The true kings and queens of repurposing are vendors there like Nanny Goat Antiques, Chairloom, and Brandywine View Antiques (who should also be visited and often in Chadds Ford), so I also always leave with great ideas. 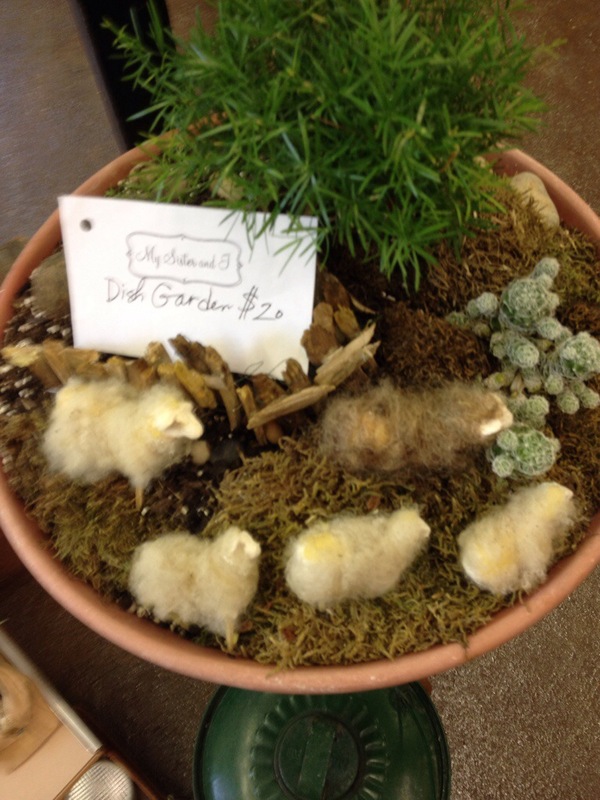 I go to high-end antiques and craft shows to educate my eye as much as anything else. I don’t really buy at those shows, I am not in the demographic they shoot for – I am just average. But you need to educate your eye, because that is how you learn. And trust me, I have seen and be able to recognize some pretty amazing things in thrift shops and picking barns as a result. I eBay too for small stuff like vintage table linens and locating the vintage plates and even cookware I like to use. I also will swap things with friends and so on. I am an insatiable bargain hunter with a knack for barter (I am told another word for it is “hondle”.) It’s fun. At the end of the day, I want my home to reflect me, not someone else who doesn’t live there. I want it to be homey and personal. And what I hang on my walls isn’t running away from the Philadelphia Museum of Art or something. I prefer things I see by more local artists and unknowns altogether. One of my most favorite things is a watercolor in a simple wood frame I bought for $20 at the Smithfield Barn. It’s no Wyeth and never will be, but it makes me happy. I buy what I like. It doesn’t have to impress anyone, I just have to like it. Home is where your heart is, so to me that makes decorating where you hang your proverbial hat easy. Assemble your home to make yourself happy. I like looking at Architectural Digest, but I don’t want to live in Architectural Digest. I would rather live in something most probably found in Country Living Magazine, truthfully. 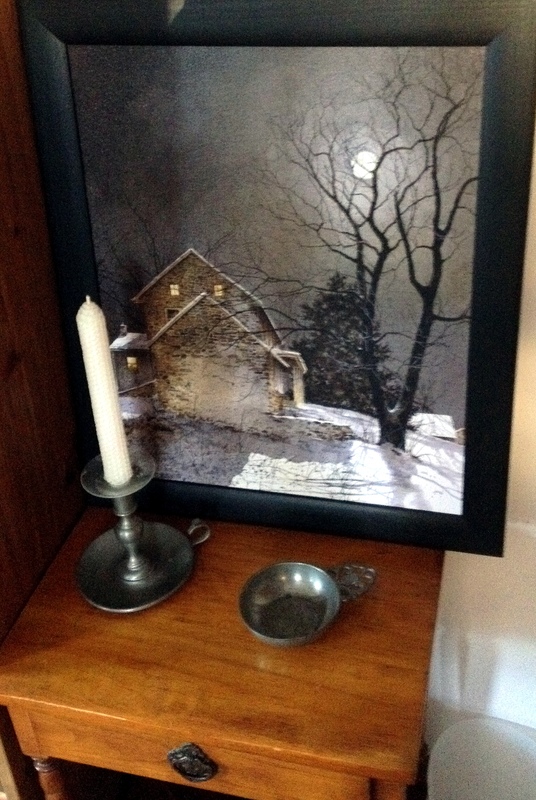 My photo of the same farmhouse in the print above! I do Pinterest. It to me is like a giant cork-board. I will pin rooms that inspire me, things I might want to try, recipes, and so on. I will also ask my friends how and what they did if I like what I see. I am not dumb, I will not do work a professional should do so you won’t see me putting up dry wall and slathering mud on, but I can do basic painting if I have to and goofy things like sponge painting stair risers. I do have a pretty good eye for color and special relationships and I can hawk a bargain. And most of all I still like looking even when there is nothing I need to buy. Window shopping is fun and inspirational. So while you might find some in the Exton or King of Prussia Malls, chances are you will find me in a consignment shop , yard sale, or barn hunting for treasures. My late father always said if you can read, you can learn to cook and I think a similar vein can be applied to decorating your home. And taste evolves, so what you like today could be completely different from ten years ago and twenty years in the future might be different again. All I am saying is start small and just try. Then if you really don’t have a Designing Women gene, find someone to help you. But they should understand that you are the boss and listen and have a compatible personality. I don’t know if I am doing it right or wrong. I just know what I like (and I know my limits.) It has been a process of trial and error over time. Kind of like when I experimented years and years ago with purple eye shadow. Some ideas work better than others. After all if you hate the color the walls are painted, you can always paint them a different color. And oh by the way, this coming weekend is an OPEN barn weekend at Smithfield Barn. I am not one for those milky pastel chalk paints and I think chalkboard paint should be banned as a decorating idea. Sorry but I am sick of seeing every piece of vintage and antique furniture looking like it was attacked by kissing cousins of Pepto-Bismol. not everything needs to be in pastel or a chalkboard. And while I do think that white milk paint look has it’s place in beach houses, I just think it has been too done. And done again. As a matter of fact my sole criticism of dealers who go to Clover Market in Ardmore, PA is not only their pricing at times leaves a lot to be desired (I mean let us get real a lot of those people pick at places I haunt so I really know some of the mark-ups) but there is soooo much of the same stuff and it is all candy coated for lack of a better description. Show me the wood once in a while! Don’t make it all look like a French meringue cookie and think that will hide the fact the piece wobbles. 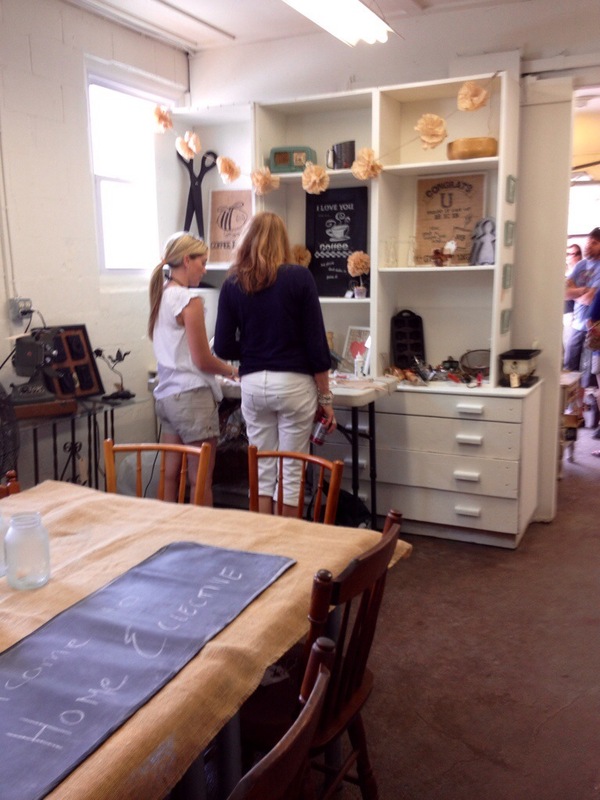 Mind you I was a long time fan of Rachel Ashwell shabby chic and loved it when she had her TV show. 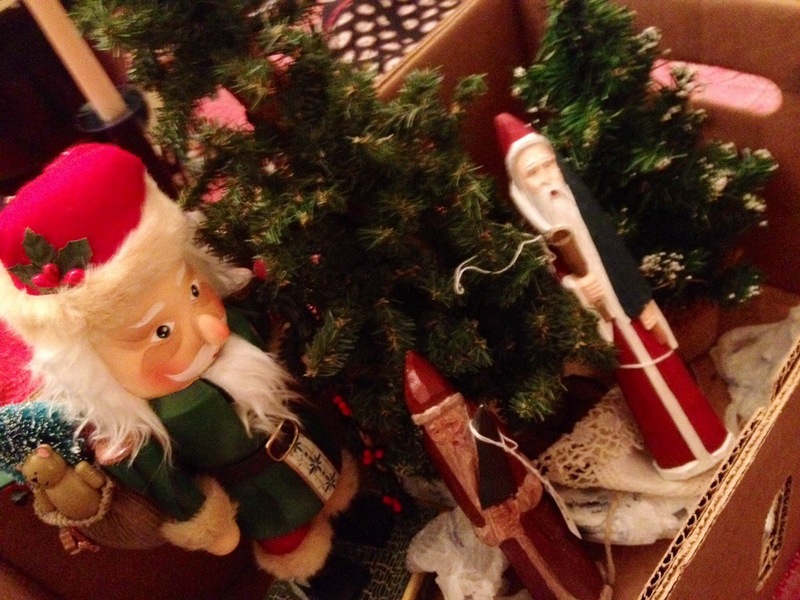 She used to go to flea markets and show you how to repurpose vintage finds. kind of like what Cari Cucksey does on her HGTV show Cash & Cari. But not everything was coated in paint. Moderation. Do I like some painted furniture? Very much so. My mother for example has a piece I have loved since it came to be. She found an antique country armoire easily 25 years ago and had an artist faux paint it and a carpenter convert the inside so she could store china, crystal and serving pieces. It definitely makes a statement and is useful storage. And the painting is beautiful – and not milk paint or pastel chalk paint. You can appreciate the artistic side of it and the lines of the piece aren’t whited out and it is sturdy enough to survive the apocalypse. My personal approach to painted furniture is if it didn’t start out life as a piece of painted furniture chances are I will not paint it. It’s just not me in the long run. Maybe my tastes will change on this, but I do not think so. As far as furniture goes I am definitely of the school that believes older is better. But I want pieces that can be used. I don’t want to live in a mini Winterthur or the Modern Museum of Art. I make no secret of the fact that I haunt picking barns, resale shops, consignment galleries, flea markets and garage and church sales. I will barter, swap, and hondle. It never hurts to ask if a better price is available. One reason I like places like the Smithfield Barn in Downingtown and Resellers Consignment in Frazer is the prices are not only unbeatable but OMG there is a constant turnover of variety and really cool pieces…and I can see the wood. Yesterday when I went hunting for my garden bench, I saw this crazy slipper chair with a matching foot stool. 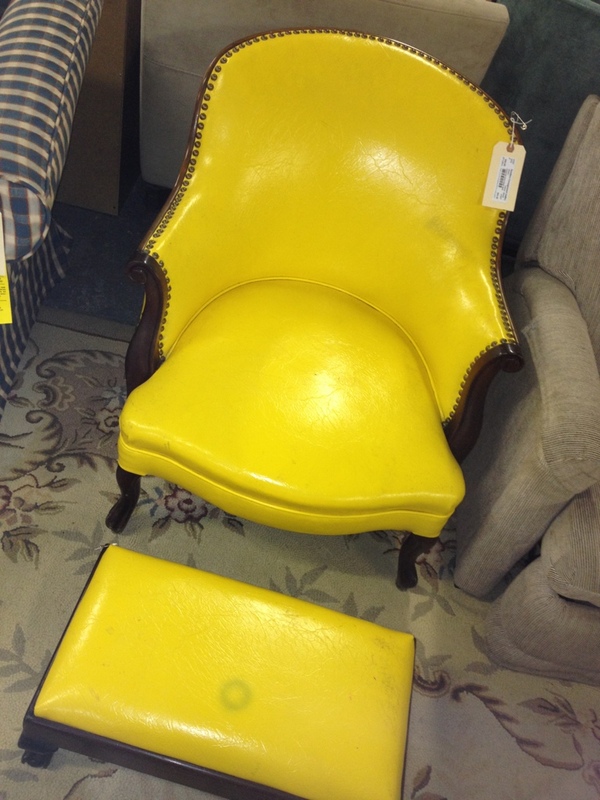 The piece was probably late Victorian but a prior owner had reimagined it in yellow leather. 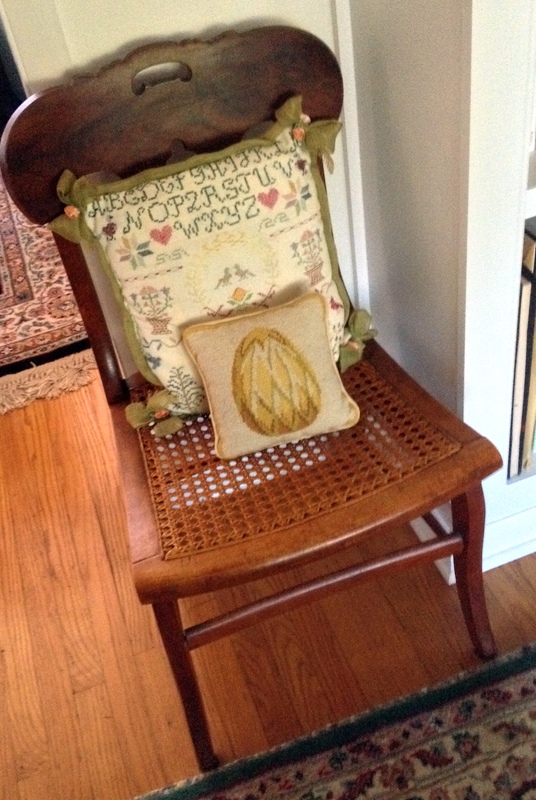 The chair was usable as is and under a $100 if memory serves and the foot stool was around $50. The pair was so fun and quirky that if I had the room they would have been a total impulse buy. Oh and the chair wasn’t painted in pastels, an added bonus. The thing about buying from Resellers that is fun is the listed price of an item will automatically decrease based upon number of days on the sales floor. But the prices are already old school estate sale prices so if you like it when you see it, buy it because chances are it won’t be there when you go back. And I have seen many furniture and antique dealers cruising the aisles of Reseller’s giant warehouse too. IF items last there more than 60 days they go to 50% off. Some people can’t believe people will go to secondhand stores and picking barns for items for their home, yet amusingly enough if the same items show up at fine furniture dealers and antiques dealers they are “darling” and “must haves”. When you buy a piece of gently used wood furniture, treat it right. Don’t rush to cover up its natural patina with paint, try cleaning it and polishing it. I am a big fan of Williamsville Wax – it is a blend of beeswax, lemon oil, and other natural oils and supposedly the company uses a recipe for this that has been used since Colonial times. And don’t be afraid to have fun with your furniture. It can still be fun and comfortable and not look like you picked it all out from Ikea and Raymour & Flanigan. And believe it or not, you can have nice things around kids. You do not have to live with plastic. That is an added bonus of some of these furniture finds- the prices are so good that say an accident occurs you can actually afford to have the piece recovered or repaired and it is actually worth it to do so. The other thing is this – educate your own eye- go to antiques shows, check out design magazines and Pinterest boards and create your own inspiration. Face it, while many would love to say they had an interior decorator or whatever, the reality is most can’t afford that and when you connect to your own rooms in your own home it is far more satisfying. And it really is home. Wow! I took a bit of an electronic vacation. It was, after all a glorious weekend. Among other things, I went to Clover Market on Sunday. 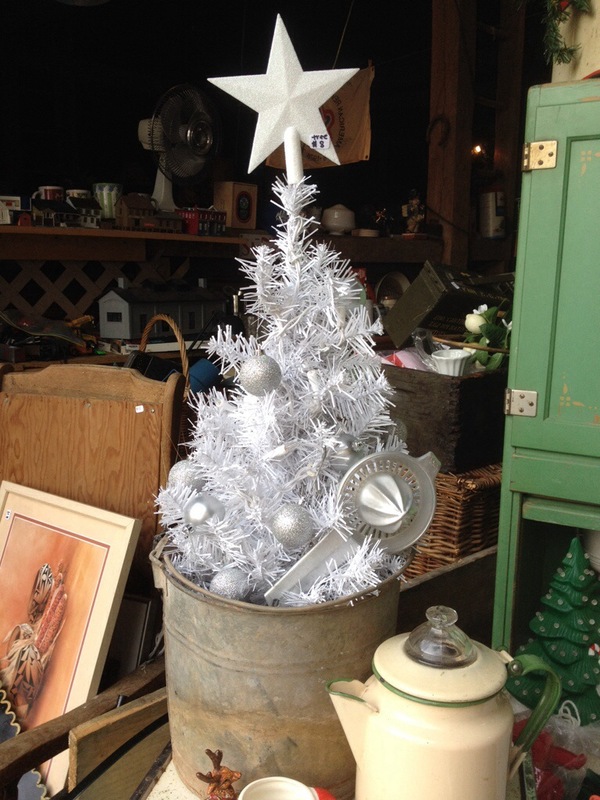 Some of my favorites were there like Nannygoat Antiques , Brandywine View Antiques, and Lura Jewelry. I saw a lot of my friends from where I used to live, and that was super nice. I did however realize while I was there and as I left, I truly am a Chester County gal now. I thought the traffic and the sheer rudeness of the drivers would make me lose my mind. And the unbelievable cacophony of noise. I loved living in Lower Merion for many years, but wow. Not any longer. They can keep it. I realize I was in a business district in a festival setting, but I am simply not made for a lot of this any longer I guess. When I got there, I got stuck going into the public parking lot because a delivery van from Ardmore’s Party Land store was having a hissy fit. The only problem is their fit should be with the township because it lets visitors to the town park in what is their loading parking space on Sundays as per the signs. I had one of my dogs with me, it is after all an outside event. People were so intent on themselves, their cell phone conversations, etc that both of us got crowd jostled and the dog almost got trampled a few times (and was on a short leash). And then there were the dog critics. There was this pair of yentas I kept seeing around the market who were literally debating the pros and cons of my dog less than two feet from me. They seemed shocked when I addressed them – “Oh, you can hear us?” one said. Talk about an eye-rolling moment. But I was polite and said nothing further and remarkably was able to keep my mouth shut…. I was also amused to see some dealers with some items that looked remarkably like some items once available at my favorite picking barn. Yes, Smithfield Barn items…at a mark up. However and most truthfully, one of the great things about going to things like Clover Market is it is a great place to not only discover new craftspeople, but re-purposing ideas. I will admit that some need to go easy on the pastel painting of wooden items and I think I am so over chalkboard paint at this point. 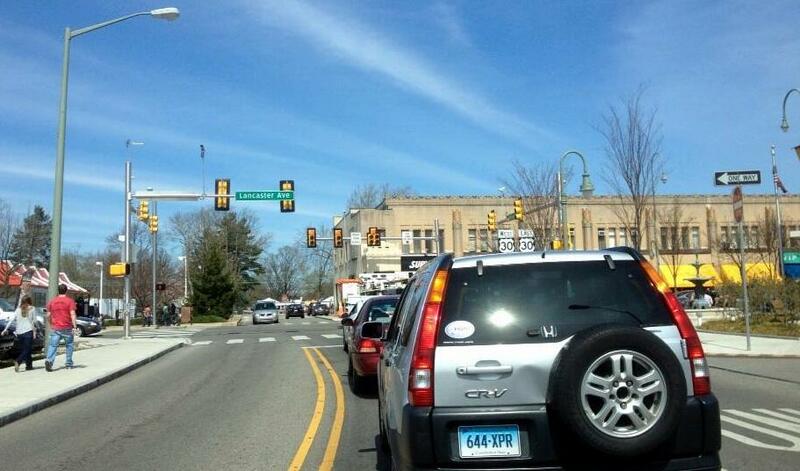 But I do not miss Main Line Traffic. Or some of the people. When I hit a certain spot on Goshen Road or on Sugartown Road I feel like I can start to breathe again. I know these overpriced and overdeveloped Main Line communities seem to live to look for more infill development ideas, but wow, there is something to be said for trees, lawns, open space and actual gardens and nature. Anyway, I decided to take a peek at The Divorced Dating Experiment. I found it appalling and that is all the air time it is getting. To each their own. I will tell you one more funny Clover Market crazy people story before I wind this post up. When I was leaving, two different women decided they wanted my parking space. Both attractive blonds. One problem: they wanted my space and neither would give ground for ten or fifteen minutes and they were (wait for it), blocking me in!!! LOL talk about a blond moment – maybe it would have helped to let the person whose space they were fighting over get out of it first?